In this post we will discuss how to resolve error connections to the SharePoint server are currently disabled because the project is in Offline mode which comes when trying to Uninstall an app in SharePoint 2013. 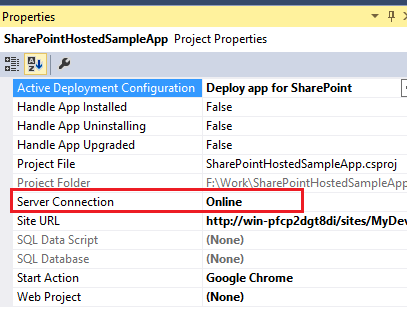 Error occurred in deployment step 'Uninstall app for SharePoint': Connections to the SharePoint server are currently disabled because the project is in Offline mode. To connect to the SharePoint server, switch to Online mode by setting the project’s Server Connection property to Online, and then try the operation again. then follow the below solution, may work for you. Open SharePoint project and then Select solution. In the Properties window check for "Server Connection". Here Select : Online and then Save. Now it should work fine.